When Prudence isn’t happy, nobody’s happy. 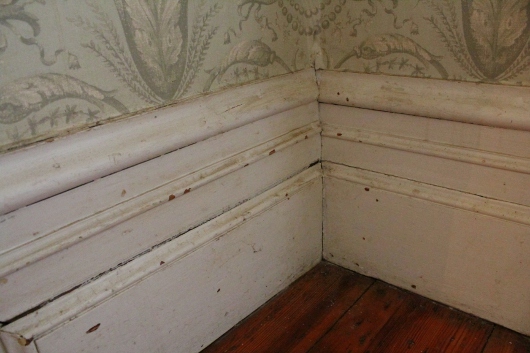 Actually, I’ve known for several years that our ancient parlor (this house was built in 1826) was in need of sprucing-up. 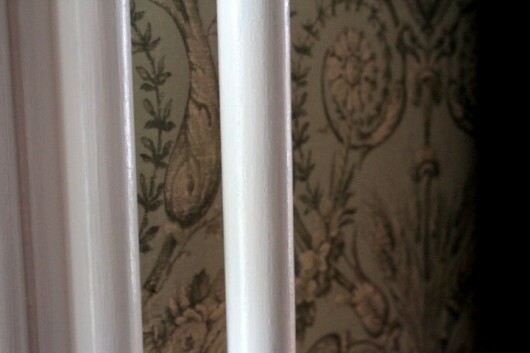 But two expensive decorative items stood in the way of progress: the wallpaper and the window hangings. The thought of spilling or spattering paint on either of these was enough to make me shudder. Enter our contractor, Phillip, and his brother, Chris. 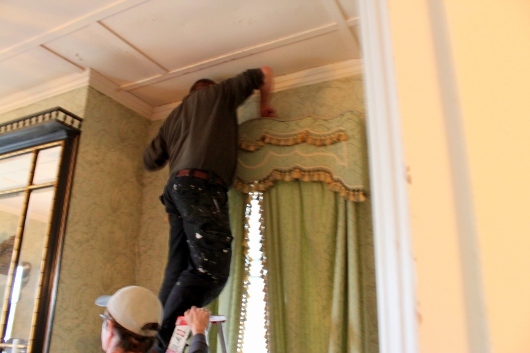 You met Chris last April, when he helped stabilize the Music Room wing of the house. Carefully, carefully, Phillip and Chris removed the ornate valances and hangings from the quartet of floor-to-ceiling windows in the room. 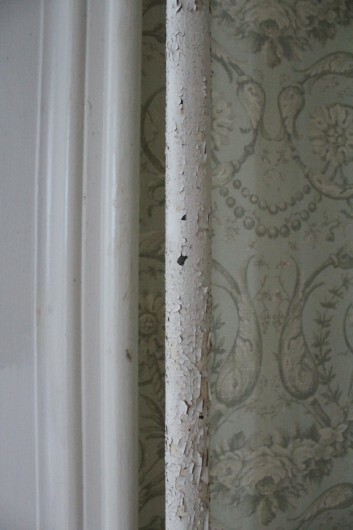 Using 40-grit sandpaper, Chris scraped the peeling paint from the two steam pipes, or “risers” in the parlor. The mess was promptly sucked up by a ShopVac. True confession: I loathe both radiators and risers. When placed in a house that was not designed to have them — ours was meant to be heated with fireplaces –they destroy the beauty of a room. Sure, late 19th century inhabitants thought the pipes were the height of sophistication. To me they are obscene. Not that I wouldn’t love the radiators and risers in your house or apartment. 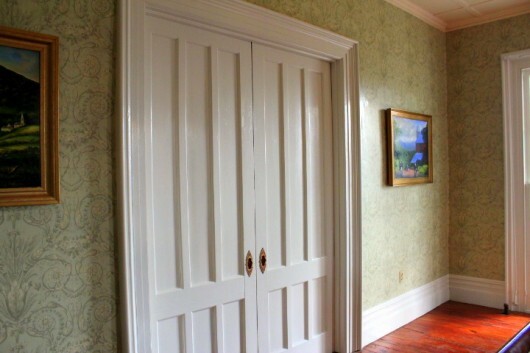 The wide Victorian baseboards and doors (the doors are wide to accommodate hoop skirts) were checked with nicks and gouges. Note: If you live in a modern house, you’d better hope that hoop skirts never make a comeback. Otherwise, you’ll have to enlarge your halls and doorways. For Scarlett O’Hara. 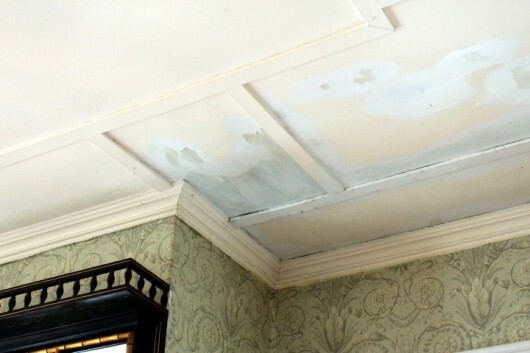 A section of the ceiling had suffered water damage. This, after an ice-dam developed in the gutter just outside the room. When Chris scraped the “new” paint away, we discovered the ceiling had earlier been painted a dashing shade of green. Dashing but too dark, I think, for the room. 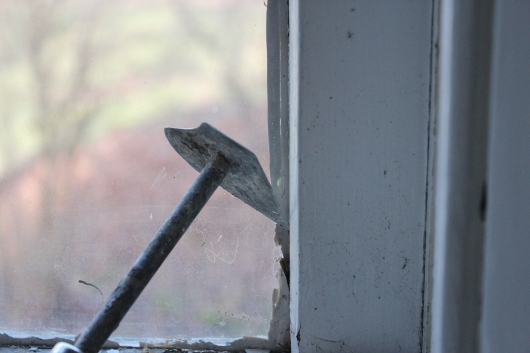 To scrape loose paint from the windows, Chris used the nifty tool you see pictured above. I think it’s called a “three-in-one.” The item is shaped for awkward corners and such. What a terrific invention. 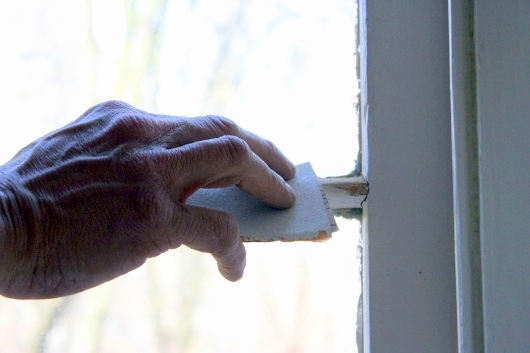 He used 100-grit sandpaper to remove the loose paint on the window mullions. I also asked Chris to paint the trickiest window in the house — a double-arched exposure, half of which is extended over the staircase. Painting that window means risking your life. But our industrious pro searched for a thick plank of wood, and found one in the (creepy) cellar. With this, he made a scaffold, by inserting one end of the plank into the sculpture niche in the staircase wall. Back to the parlor. I’ll show you more of the “finished” room when the ceiling is done, and the window hangings have returned. Meanwhile, I’m happy to see progress in this house. Prudence, who rarely alters her expression, seems pleased with the work, too. Love the work! But that ceiling seems odd to me…it doesn’t fit….too plain for the. Rest of the room….are you sure there isn’t something delightful underneath the flat framing? Oh, it must feel great to have that work done! It looks terrific. Well done! How pretty! All dressed up for spring! Looks like a project…how long did it take? Hi Sherry – Lily likes the idea of treats! Regarding the newsletter, I send one out each week. If you use gmail, my updates are probably landing in your “promotions” folder. If you don’t have gmail, just send a note to Contact Kevin and I’ll manually re-subscribe you. Wow Kevin, thanks for all the little history details! Such delightful side notes on form follows function–especially the hoop skirt door width comment. Thank you once again for sharing. I am still chuckling about the knicks on the baseboards as well. Who’d have thought it. Beautiful! What an inspiration. Thank you. I just love it when you posts pictures of your house! It’s simply beautiful. The quip about hoop skirts and wide doors made me chuckle. I, too, hope they never make a comeback! Thanks for sharing Kevin! We lived in an older house on Ft. Leavenworth that was built in 1902. We had radiators with bun warmers and tin ceilings. I used to keep pans of water on the radiators to help our furniture out with the dryness. It was a neat old house but the army’s way of upkeep was to just splash another coat of paint on it . It is marvelous that you care for yours so lovingly. When I seen your post on FB, and you mentioned you painted the parlor, I was so afraid you ripped down the character of the room (wallpaper/ curtains) and painted the walls!! I was delighted to see you just gave the room a well needed uplift while keeping the history! The room is looking great… I think in your last pic, I seen Prudence grin!! Everything looks just lovely. You do have a beautiful home and attention to detail is impressive. The painter is a rare one and a keeper! He should use your pictures to advertise! Your before and after (love those pocket doors!) shows that the devil is indeed in the details. Wish I lived closer. I would throw myself at your house for all sewing and upholstery projects. As I get older I pick and choose what I want to work on. It would be a delight to work in such a loved atmosphere and to help you to create anything your little heart desired. 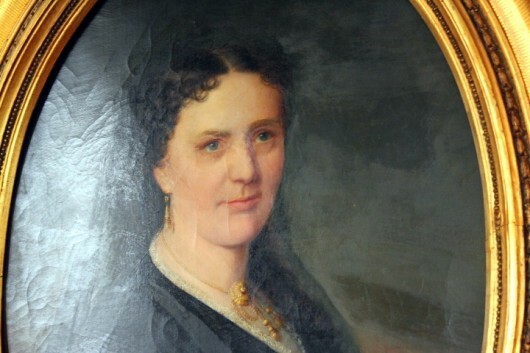 I love ancestor portraits, too, and have a matched set of a stunning couple who are actual relatives of mine, hanging on my walls. I couldn’t help but notice the detail of ‘Prudence’s’ hair is really well done. Do you know who she is? Thanks for sharing the parlor up-grade, Kevin. My ordinary little ranch needs lots of up-dates. I am hoping to get the living room carpet removed and the hardwood floors underneath refinished soon. I have spoken with someone who calls himself ‘Mr. Sandless” and refinishes the wood without sanding, which I think would be wonderful. He claims the solution he uses is non-toxic also. Have you ever heard of this method? I hadn’t before and I still wonder whether it is really the best way to go. I will do more research before I commit to it, but just curious to know if you have encountered the method. By the way, I’m sure the parlor is going to look gorgeous when everything is back together and I’ll bet Prudence will have a big, toothy smile on her face! The house renovations are lovely. This is a perfect time to do them and you seem to have found a very competent person in Chris. As an art major, I can’t help but wondering when you finish the room, if Prudence isn’t ecstatic, if maybe it is because she might need a face lift and fresh makeup herself. Have you checked in to having her cleaned and restored? If she has hung gracefully guarding that fireplace for long I think she may need it. Awesome old house, they don’t build them like that anymore. I read that you don’t care for the look of the radiators in your home. 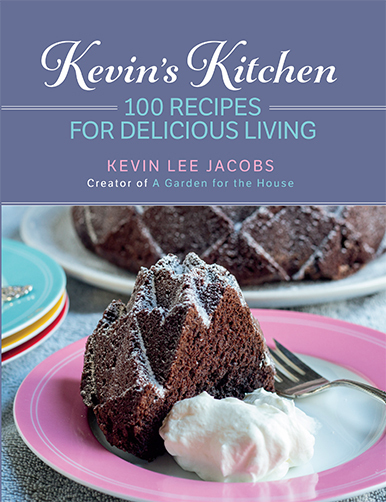 I thought you might be interested in checking this website out: http://www.katescovers.com/. I have bought a few for my own home and they help make those old radiators a bit more palatable. I have to repaint the 3 front doors on my house, which is red brick. None of the colors I love really seems to work with red brick. And the inside walls are ALL painted off white. I feel as if I’m living in an institution. Ha! If hoop skirts come back, I’ll have to be hopelessly out of fashion. More or less like I am already. Such a lovely home and your workman is a prince! Hang onto him. 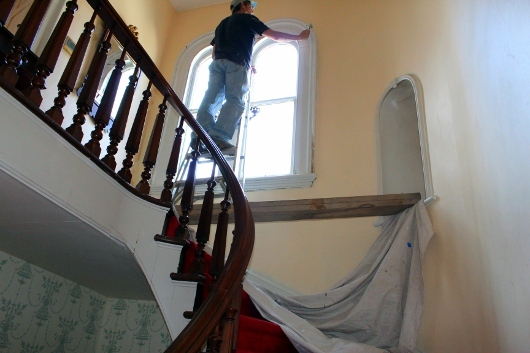 Your words and pictures give me goosebumps…my parents did all their own work in restoring a mid-1700s home in NJ. 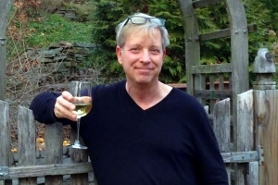 As a young teenager–I’m now 72–I lived through those projects. You bring back treasured memories. Thank you. Well done…looks 100% better but yes the ceiling needs work. Love that you share this wonderful old house with us….Happy Easter to you and yours! Your home is incredible! The extra TLC you offer only preserves it’s charm! Keep up the good work, thanks for inviting us in! Do you have that same type of ceiling in other rooms of your house? If so, have you investigated what’s underneath the current layer of paint? We used to live in a two story home, probably built in the early 1900’s. It had wood floor throughout. Oak on the first floor and maple on the second. The first floor had been covered over with carpeting. Glue-down, rubber backed in the kitchen and pantry. It was a mess to get off. We had the first floor sanded, professionally. We did the project in two parts. First the kitchen and entry. All appliances got moved out and into the dining room. Then all furniture moved into the kitchen/entry for the living and dining room half. We hand brushed varnish on – 3 coats. This project was before we had kids. The floors turned out lovely. My kids learned how to crawl on slippery floors. It was funny to watch as they struggled to move when we visited someone’s home that had carpeting everywhere. I miss that old house, with it’s built-in buffet w/ leaded glass in the upper cabinet doors, the walk-in pantry with it’s own little window and lots of storage, both open shelves and cupboards. Oak pillars between the entry and living room and living and dining room, 10″ wide baseboard and decorative molding in every room, oak staircase and banister to the second floor. Now I live in a contemporary house, that’s very different, but still has lots of unstained oak and pine inside. Pine tongue and groove ceiling in the Great Room, finished just with sanding sealer (we put that on before the wood was attached to the ceiling). I appreciate the older house and all the work involved with it’s upkeep. 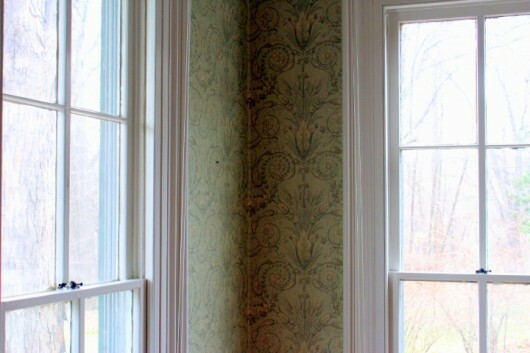 I owned a wonderful very old home such as yours in Virginia and had it completely painted and wall papered and restored. I was talked into removing the radiators by the decorator and lived to regret it. 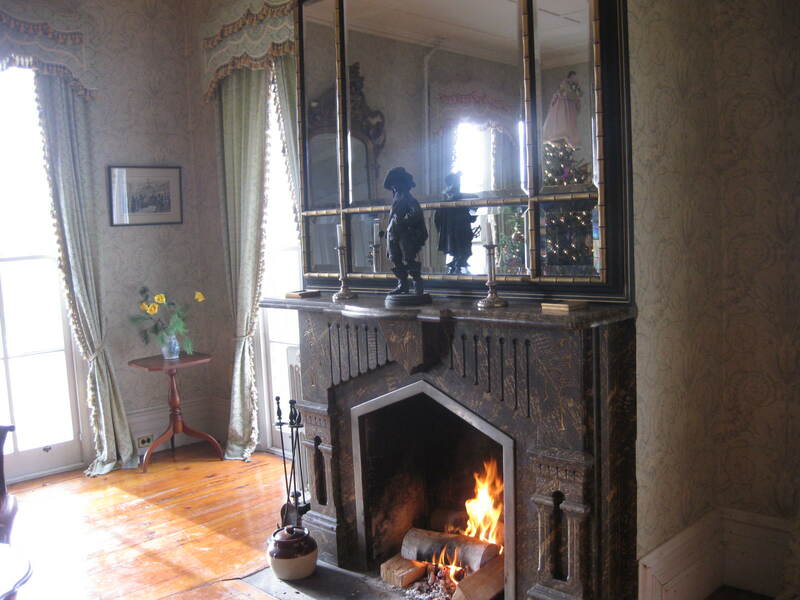 It may have been that the rooms originally were heated by the fireplaces but if you think about it you will remember in literature it was always said to be cold in winter. We froze our tails off and I never forgave the decorator! I now adore old fashioned radiators!!! your site so much, wishing you a blessed Easter. As Barbara Streistand always says, “Excellence is in the details”. You found a gem of a painter and I hope you told him he is never allowed to retire or move. Fabulous work! What a beautiful, stunning makeover!! Love the house!! I have just three things to say: Gorgeous! Gorgeous! Gorgeous! It’s amazing what a little paint can do to freshen a room. I’m so glad you kept the wallpaper as it’s a beautiful pattern. Is it old? The guys doing this work are meticulous and obviously respect the old place. Those windows have a gazillion little surfaces and the glazing is a maintenance thing. Please pass on my respects and compliments to your artisans for a job well done. I particularly like the platform they rigged to work the stairway window. Good job to all !!! Kevin- I shared this with my contractor pal and his first comment was, “Is there lead paint there if it is so old? If so, did the contractor take precautions? A shop vac would blow it right into his and your lungs.” Just asking….want you to be safe! I have a center chimney house down in CT built about 1730. In 1980 we added an authentic appearing addition for a kitchen and more bedrooms. Now it is past time to redo the wide plank kitchen floor and I know I have to bite the bullet, but it seems like an impossible job thanks to all the large cupboards (three) that will have to be moved to a glassed in porch plus all the ceramics that will have to be removed from the tops of wall cupboards and from the open shelves of one cupboard plus the two friges and one stove and so on – and on – and on. I need courage! And I really empathize with the effort made at your marvelous house. always surprises me that people paint NON-feature items (like those steam risers) a colour that will make them stand out, instead of a colour that will make them blend in to the background. After all, they aren’t part of the trim. why not paint them a colour similar to the wallpaper so they’re not so obvious? I love watching old things being remade! thank you for sharing! The parlor looks great. You were lucky to find a painter willing to work on old paint. 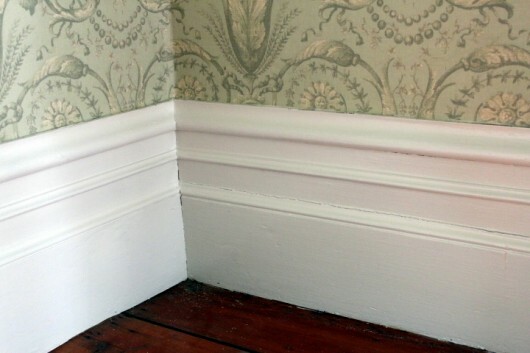 My house was built in 1796 and no one will touch the paint even though, over the years extensive work has been done. Happily we are able to do paint work ourselves. I gave my car a good cleaning today — beat a winter’s worth of sand and gravel out of the floor mats, vacuumed EVERYthing extremely well, cleaned all the vinyl, ran it thru a carwash and touched up a couple parking lot dings in the paint. I filled its thirsty tank and gave it clean oil to digest, and even gave it almost-new summer tires (sandals?) to wear. My 190,000-mile car is now wearing a very pleased expression (okay, that would be me, actually). Lovely transformation. It looks great and prudence will be happy there. Your have some really handy painters there. worth their weight in gold or at least paint. Love those window coverings too. You live in such an enchanting world! Love your house,love your recipes and stories,but most of all,love your sense of humor! Nice work. We are getting new windows installed and replacing on with a glass door that will lead to a future 3 season porch!! Our home is not historic, but possesses marvelous views of field and north woods in the lakes region of Minnesota. 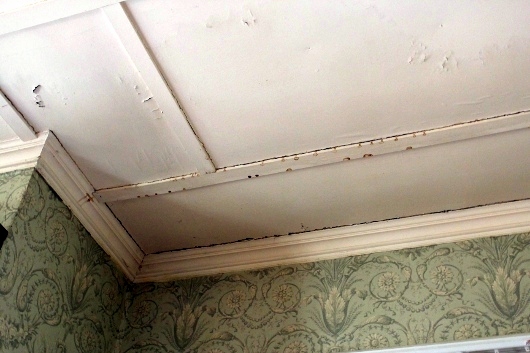 Much luck on completing your ceilings, you are certainly off to a great start!! I agree with Prudence. Great face lift! Ah yes, the hated ice dams on the roof! We lived for 32 years in Berne, not far from you, and we endured the ice dams and the havoc wrought by them repeatedly! 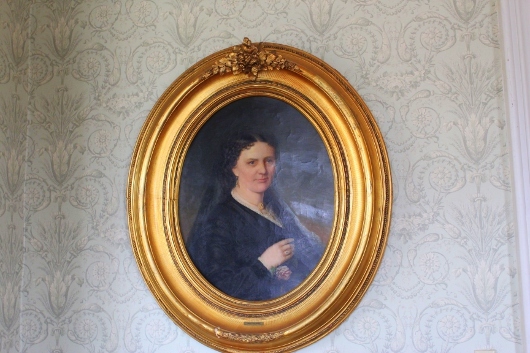 Our house was ~ 180 years old, and we did countless renovations over the years. I admire your fortitude and motivation to keep your lovely house in order. I was interested in those pocket doors, which I only learned recently are NOT a modern innovation. Our house out here in the West is new, and we had pocket doors installed throughout….what a space-saver! We have lots of windows, and the pocket doors provide much more wall space for pictures than we would otherwise have. We seriously downsized on the scale of this house, and we are off the grid. Happy Easter and I LOVE that mixer! We are actively procrastinating about a major painting project in the livingroom extending down a long hallway. 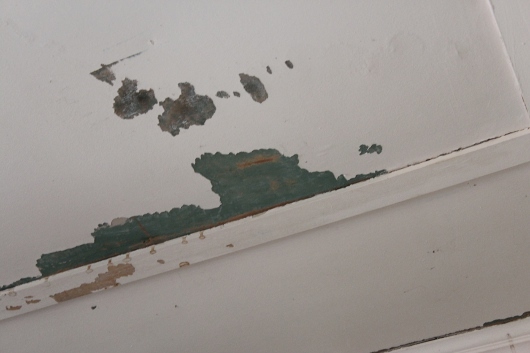 Paint is peeling all over, high, low, and everywhere – unsightly. See us delay, and delay. One day we’ll be forced to do it. Ughhhhh. I was wondering about your ceiling too. Why all those jimmy jammed patched looking places? Poor repair of water damage ages ago? or like some one earlier said, wonder what is under that ceiling. If you could afford it, I would cover it with the metal tiles that are reproductions of the old tin ceilings. They even have a kind of pvc type plastic ones that are guaranteed to last a long time. Love your house. I grew up in a century plus “salt box”, but it was no where near this fancy and sadly had no fireplaces. Well I hope you had a Happy Easter ! We just finished having our front steps redone with bricks & blue stone, it really looks nice & he is coming back to put in some pavers for us. Our next big project will be the kitchen. Love your antique victorian! Our home is a cape circa 1983 & not nearly as decorative & ornate. More country but we like it! Kevin — you’ve done a great job recreating a great old house. We just completed a redo of our dining room. Well-almost done. Still waiting for an old Tanglewood poster to come back from the framer and need to buy a rug and new chair. But love the new red paint, new hickory floor (instead of the old pink rug) and new window treatments. Now we have to get to the “project creep” portion – repainting the walls going upstairs and the upstairs hall and doors. What a transformation and so much work. Looks AWESOME!!! WOW! Beautiful, but I would expect no less from you! Love your whole house and garden! House looks great. I guess spring is the inspiring time for a new look. We have redone a bedroom and next the bathroom. Yippee. Our Victorian (1880) was built with steam radiators and risers. They’re actually beautiful works of art (someone called them pyramid-style radiators; they don’t have the usual fins), and they were originally painted gold. They’re too big to ignore, so we flaunt them. But the pipes are another story. Those I want to disappear into the walls. We use Napa gold engine paint on the radiators, and it adheres very well, I think because it is designed to withstand intense heat. But how do you keep paint on the risers? The paint is always breaking off. I certainly don’t want to paint those with gold heat-tolerant engine paint. Green is such an amazing color but I think a more vibrant green would work better for this room something with shimmer and the moldings should be painted a different color. And I also think that staircase is way to pretty to be covered with red carpet. Just saying. And to further highlight the era that the house was built in a beautiful rug that accentuates your color scheme would be pretty too. And more pictures that have a round or oval frame would further highlight the classiness of this room. I also think corner tables not sure what there called would also bring more warmth to the room and would be a good excuse to showcase your flowers. Beautiful. What a labour of love this wonderful old house is.